The extended Canadian Middle Atmosphere Model (eCMAM) was recently run in a nudged mode using reanalysis data from the ground to 1 hPa for the period of January 1979 to June 2010 (hence the name eCMAM30). In this paper, eCMAM30 temperature is used to examine the background mean temperature, the spectrum of the diurnal tides, and the climatology of the migrating diurnal tide Dw1 and three nonmigrating diurnal tides De3, Dw2, and Ds0 in the stratosphere, mesosphere, and lower thermosphere. The model results are then compared to the diurnal tidal climatology derived from Sounding of the Atmosphere using Broadband Emission Radiometry (SABER) observations between 40 to 110 km and 50° S to 50° N from January 2002 to December 2013. The model reproduces the latitudinal background mean temperature gradients well except that the cold mesopause temperature in eCMAM30 is 10 to 20 K colder than SABER. The diurnal tidal spectra and their relative strengths compare very well between eCMAM30 and SABER. The altitude-latitude structures for the four diurnal tidal components (Dw1, De3, Dw2, and Ds0) from the two datasets are also in very good agreement even for structures in the stratosphere with a weaker amplitude. The largest discrepancy between the model and SABER is associated with the seasonal variation of De3. In addition to the Northern Hemisphere (NH) summer maximum, a secondary maximum occurs during NH winter (December-February) in the model but is absent in SABER. The seasonal variations of the other three diurnal tidal components are in good agreement. Interannual time series of Dw1 and De3 from both eCMAM30 and SABER reveal variability with a period of 25 to 26 months, which indicates the modulation of the diurnal tides by the stratospheric quasi-biennial oscillation (QBO). Atmospheric solar tides are planetary-scale waves with periods that are harmonics of a solar day (i.e., 24, 12, 8 h, etc.). Solar tides can be detected in basic atmosphere parameters such as temperature, wind, and density or in tidally induced effect such as chemical composition and airglow emissions. Tides can be generated by either the diabatic heating of the atmosphere (Chapman and Lindzen 1970) or wave-wave interactions (Teitelbaum and Vial 1991; McLandress and Ward 1994; Angelats I Coll and Forbes 2002). The diabatic heating source includes direct absorption of solar radiation (for example, infrared radiation by water vapor in the troposphere, ultraviolet radiation by ozone in the stratosphere, and extreme ultraviolet radiation by molecular oxygen in the thermosphere) and tropospheric latent heat release due to deep convection in the tropics (Hagan 1996; Hagan and Forbes 2002). Solar tides with a specific period can be further divided into two subgroups: (1) migrating tides which propagate westwards with phase velocity following the apparent motion of the Sun and (2) nonmigrating tides which have different phase velocities to the migrating tides and can propagate westwards, eastwards, or remain stationary relative to the ground. Except for occasional extreme planetary wave activity, atmospheric solar tides represent the dominant dynamical component of the mesosphere and lower thermosphere (MLT) region (Forbes 1982). Tides that propagate into the MLT region reach large amplitudes and profoundly affect the large-scale dynamics, chemistry, and energetics of this region. They transport momentum and energy upward from the source regions (primarily the troposphere and stratosphere) and then dissipate in the MLT region through various instabilities, molecular viscosity, ion drag, and wave-wave or wave-mean flow interactions (Forbes et al. 1993; Miyahara et al. 1993). Tides can modify the upward propagation of gravity waves and their momentum deposition in the MLT region via critical layer filtering mechanisms (Fritts and Vincent 1987) and via modulation of the buoyancy frequency (Preusse et al. 2001). They also play a major role in the diurnal cycle of chemically active species and large-scale constituent transport in the MLT region (Coll and Forbes 1998; Ward 1998; Ward et al. 1999; Marsh and Russell 2000; Zhang et al. 2001) and thus influence the chemical heating in this region (Smith et al. 2003). Tides can also cause the mesospheric inversion layers (MIL) at low latitude (Gan et al. 2012). In addition, atmospheric tides have recently been found to cause significant spatial and temporal variability in the ionosphere (Forbes et al. 2000; England 2012 and references within). In the present study, we focus on the diurnal component of the solar tides (i.e., the diurnal tides). The sun-synchronous or migrating diurnal tide Dw1a is arguably the largest and most persistent feature of the large-scale wind and temperature fields in the equatorial and low-latitude MLT region (Mukhtarov et al. 2009). However, the nonmigrating diurnal tidal amplitudes have been found to be equal to or exceed the migrating diurnal tidal amplitude at some locations and/or time (Lieberman 1991; Forbes et al. 2001, 2003a, [b]; Oberheide and Gusev 2002; Du 2008; Ward et al. 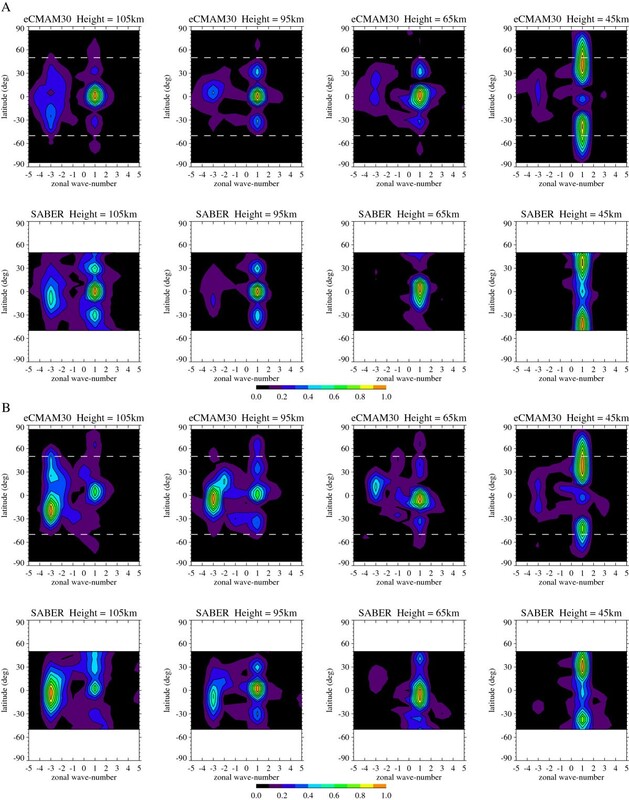 2010) and cause significant longitudinal variability in the MLT (Ward et al. 2010) and ionospheric region (England 2012). The climatology of both migrating and nonmigrating diurnal tides has been revealed by satellite temperature/wind observations such as the High Resolution Doppler Interferometer (HRDI)/Wind Imaging Interferometer (WINDII)/Microwave Limb Sounder (MLS) on board the Upper Atmosphere Research Satellite (UARS) (Hays and Wu 1994; McLandress et al. 1996; Khattatov et al. 1996; Talaat and Lieberman 1999; Ward et al. 1999; Forbes et al. 2003a, [b]; Manson et al. 2004; Huang and Reber 2004; Forbes and Wu 2006), the TIMED Doppler Interferometer (TIDI)/Sounding of the Atmosphere using Broadband Emission Radiometry (SABER) on board the Thermosphere Ionosphere Mesosphere Energetics and Dynamics (TIMED) satellite (Wu et al. 2006; Forbes et al. 2006; Zhang et al. 2006; Oberheide et al. 2006; Wu et al. 2008a, [b]; Pancheva et al. 2009; Xu et al. 2009b; Sakazaki et al. 2012) in the MLT region, and the CHAllenging Minisatellite Payload (CHAMP) radio occultation (RO) (Zeng et al. 2008; Pirscher et al. 2010; Xie et al. 2010) in the upper troposphere and lower stratosphere (UTLS) region. Ground-based instruments such as radars and lidars have also been used routinely for diurnal tide observations in the range of 80 and 120 km (Fritts and Isler 1994; Vincent et al. 1988, 1998; Yi 2001; Manson et al. 2002; She et al. 2004; Zhang et al. 2004; Yuan et al. 2006, 2008; Lu et al. 2012; Huang et al. 2012, 2013a, [b]; Gong et al. 2013). Besides observations, models including sophisticated general circulation models (GCMs) and simpler mechanistic models are used to simulate the latitudinal structure and seasonal variability of the diurnal tides (Forbes 1982; Miyahara and Miyoshi 1997; Miyahara et al. 1999; Hagan et al. 1995, 2009; McLandress 1997, 2002a; Hagan and Roble 2001; Grieger et al. 2002; Huang et al. 2005, 2007; Mayr et al. 2005; Ward et al. 2005; Du 2008; Chang et al. 2012; Huang et al. 2013a, [b]). Although the general characteristics of the diurnal tides can be understood from classical tidal theory (Chapman and Lindzen 1970), detailed modeling studies are important. They provide the means to examine the tidal structure cleanly (observations are generally affected by sampling issues) and help in the interpretation of the observed features through investigation of physical mechanisms such as tidal forcing, tidal propagation and dissipation, and tide-mean flow and tide-wave interactions. Although ground-based instruments can provide long-term and high-spatial-and-temporal-resolution observations, they can only be deployed at a limited number of locations. As a result, they cannot provide a globally tidal climatology. In addition, ground-based observations from a single station cannot resolve tidal components with different zonal wave numbers. Satellite measurements of atmospheric tidal parameters have the advantage of including data points from many geographic locations. However, the high orbital inclination needed to get nearly global coverage also results in a slow local time precession rate, which introduces sampling and aliasing errors. These issues are particularly troublesome when trying to resolve atmospheric structures that are ordered in local time and are nonsteady. The time interval required to sample observations covering 24 h of local time is long enough for the dynamic structures to vary significantly in form. This makes resolving any short-term variability in dynamic features difficult when using satellite observations alone (Forbes et al. 1997). The development of numerical models and their comparison with observations are vitally important for testing our understanding of the atmospheric systems. If all of the relevant physical processes are correctly represented, the model should provide a faithful simulation of atmospheric tides and support the interpretation of observed tidal features. Deficiencies in the model simulations indicate that important processes have been omitted or inadequately treated. While free-running models are important for understanding the mechanisms responsible for the observed tidal features, they cannot be used to simulate specific tidal events observed in the real atmosphere. Specific comparisons can, however, be made if the troposphere and stratosphere are constrained by the observations, as is done with data assimilation systems. The global meteorological analysis (operational)/reanalysis data have been widely used for meteorological and climatological studies from the troposphere to the stratosphere over the last decade. The main advantage of these datasets is that various operational observations from the surface to the stratosphere (approximately 50 km) are assimilated into self-consistent first-principle models, leading to uniformly gridded and globally available data for many variables. To date, no middle atmosphere model is data-assimilated for the whole domain due to the scarceness of observations in the MLT region. However, there has been effort on using assimilated meteorological analysis data to constrain the middle atmosphere model in the troposphere and stratosphere (Marsh 2011; McLandress et al. 2013; Davis et al. 2013). The extended Canadian Middle Atmosphere Model (eCMAM) (Fomichev et al. 2002; Beagley et al. 2010) is recently nudged to interim version of the European Center for Medium-Range Weather Forecasts Reanalysis (ERA Interim; Dee et al. 2011) data up to 1 hPa using a simple relaxation procedure from January 1979 to June 2010 (hence the name eCMAM30). Diurnal tides from ERA Interim have shown the most similar results to those from SABER in the stratosphere comparing to other well-known reanalysis datasets (Sakazaki et al. 2012). Herein, we describe the background temperature field and the diurnal tides from eCMAM30 in the stratosphere and MLT region and validate our simulations against temperature derived from SABER/TIMED. Note that SABER data are not assimilated in ERA Interim reanalysis, making it feasible to evaluate the nudged eCMAM30 data. From this study, we are able to make quantitative statements for the first time on how well the eCMAM is simulating the diurnal tides comparing to real-time observations. 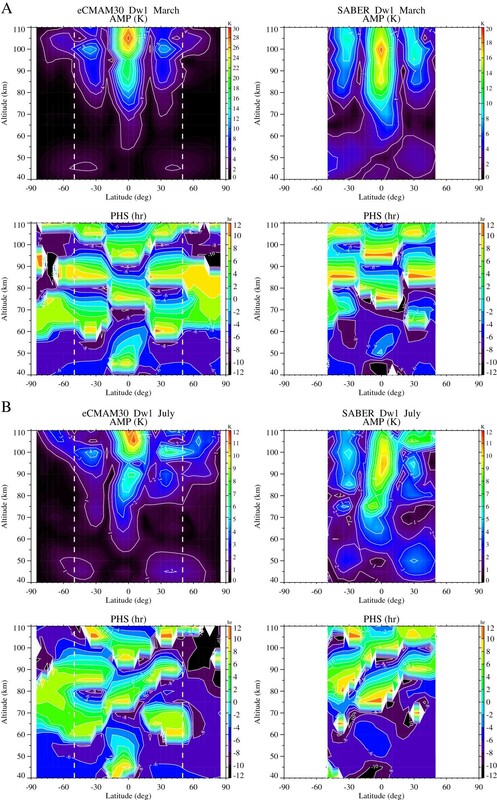 In this paper, we focus on the climatology of the background temperature field and the diurnal tidal components from eCMAM30 and the extent to which they match the equivalent parameter obtained using SABER observations. The term climatology refers to multiyear averages and their seasonal variations. The climatology is useful for predicting general conditions to be seen at a particular location and time of year. The tidal fields to be described are a function of altitude, latitude, zonal wave number, and month. Therefore, it is only possible to illustrate a small fraction of our results in this paper. The authors can provide additional figures that depict the full range of our results upon request. The paper is organized as follows. In ‘Data and methods’ , we describe the two datasets used. This includes a very brief discussion of the SABER data and a more detailed discussion of the eCMAM30 simulation. In ‘Results and discussion’ , we present the results, starting with the climatology of eCMAM30 background temperature and its comparison with SABER. We then present the diurnal tidal spectrum as a function of wave number (from −5 to +5: the wave numbers identify tidal ‘components’ or ‘tides’ , and positive (negative) zonal wave numbers imply westward (eastward) propagation) from both eCMAM30 and SABER. This is followed by the climatological altitudinal-latitudinal structures of the migrating diurnal tide Dw1 and three nonmigrating diurnal tides De3, Dw2, and Ds0 from both datasets. A description of the seasonal variability of these four diurnal tidal components is also presented. We end this section with a simple discussion and comparison of the interannual variability of the diurnal tides (e.g., Dw1 and De3) between eCMAM30 and SABER. Our main results are summarized in ‘Conclusions’. The SABER instrument was launched onboard the TIMED satellite on December 7, 2001. SABER is a ten-channel broadband radiometer covering a spectral range from 1.27 to 17 μm. The temperature profile is retrieved from two 15-μm and one 4.3-μm CO2 radiometer channel measurements in the tangent height range spanning approximately 20 to 120 km. The local-thermodynamic-equilibrium (LTE) and non-LTE retrieval algorithms are used, respectively, at altitudes below 70 km and in the upper MLT region (Mertens et al. 2004). Remsberg et al. (2008) assessed the quality of version 1.07 temperature data and suggested that the random error is no more than 2 K below 70 km, while in the upper MLT region, the error increases with altitude from 1.8 K at 80 km to 6.7 K at 100 km. Yue et al. (2013) and Jiang et al. (2014) examined how the systematic and random errors in SABER temperature data may affect the calculation of the amplitudes of the migrating terdiurnal tide and 9-/13.5-day oscillations, respectively. They replaced the actual data by random noise in a normal distribution with the width of the measurement uncertainties and then performed Monte Carlo simulation. Their results show that the measurement uncertainties cause negligible errors in deriving the wave amplitudes and phases even at 120 km where the random error is as large as 10 K. The effective vertical resolution of SABER temperature is approximate 2 km. SABER is in a slow-processing polar sun-synchronous orbit and can only make measurements at two local times per day. The local time does shift a small amount each day (12 min), accumulating to 24 h for about 60 days at low to middle latitudes when both ascending and descending samples are combined. Due to the vertical sightline to the velocity of SABER, the latitude coverage is from 53° latitude in one hemisphere to 83° in the other. We analyzed both SABER version 1.07 and the latest version 2.0 temperature data from January 2002 to December 2013 for this paper, and the difference between the two is minor. In this paper, only version 2.0 SABER temperature analyses are presented (see Huang et al. 2006; Xu et al. 2007a, [b], and Smith 2012 for climatological temperatures using earlier versions of the SABER data). where T ¯ ZD is the daily zonal temperature, T ¯ 0 is the 60-day averaged zonal mean temperature of both ascending and descending nodes, and A n and t n are the daily amplitude and phase of the migrating tides. t n is defined as the local time when tides reach the maximum amplitude ( ω 0 = 2 π radian 24 hour , t LT is in hours, n = 1 to 4). For this analysis, we have used the eCMAM (Beagley et al. 2000, 2010; Fomichev et al. 2002; McLandress et al. 2006) with a top at 2 × 10−7 hPa (geopotential height approximately 220 km but dependent on the solar cycle) that was enhanced by inclusion of neutral and ion chemistry. The model has a triangular spectral truncation of T32, corresponding to a 6° horizontal grid. There are 87 levels in the vertical, with a resolution varying from several tens of meters in the lower troposphere to approximately 2.5 km in the mesosphere. The previous version of the model included the non-LTE parameterization for the 15-μm CO2 band; solar heating due to absorption by O2 in the Schumann-Runge bands (SRB) and continuum (SRC) and by O2, N2, and O in the extreme ultraviolet spectral region; parameterized chemical heating; molecular diffusion and viscosity; and ion drag. The current version of the eCMAM also includes comprehensive stratospheric chemistry (de Grandpre et al. 2000) with radiatively interactive O3 and H2O, a simplified ion chemistry scheme (Beagley et al. 2007) over a vertically limited domain, and non-LTE treatment of the near-infrared CO2 heating (Ogibalov and Fomichev 2003). The Hines (1997a, [b]) nonorographic GWD scheme is used in this model. The model includes realistic tidal forcing due to radiative heating, convective processes, and latent heat release (Scinocca and McFarlane 2004). These processes have been shown to provide the forcing necessary to generate the migrating and nonmigrating tides in the free-running eCMAM (McLandress 1998, 2002a, [b]; Ward et al. 2005; Du et al. 2007; Du and Ward 2010; Du et al. 2014). Recently, the horizontal winds and temperature below 1 hPa from this version of the eCMAM are nudged (i.e., relaxed) to the 6 hourly horizontal winds and temperature from the ERA Interim reanalysis data from January 1979 to June 2010. The nudging approach is designated to primarily constrain synoptic space and times scales in the model, which are well represented in the reanalysis data. This is accomplished by performing the relaxation in spectral space and applying it only to horizontal scales with n ≤ T21, where n is the total wave number. The nudging tendency has the form −(X − XR)/τ0, where τ0 = 24 h is the relaxational timescale and X and XR are, respectively, the model and reanalysis spectral vorticity, divergence, or temperature coefficients (Kharin and Scinocca 2012). Linear interpolation is used to compute the reanalysis variables at intermediate times between adjacent 6-h intervals (McLandress et al. 2013). No nudging of chemistry fields is included in eCMAM30. Global total temperature is extracted from the model every 6 h for the period of January 1979 to June 2010. In order to obtain the background mean temperature and the monthly mean amplitude and phase of the diurnal tides (from zonal wave number −5 to +5), a 2-D Fourier transform in longitude and time is applied to the total temperature to get the spectrum density in the domain of wave frequency and zonal wave number. On the basis of the spectrum density corresponding to a particular tidal component, an inverse Fourier transform is used to derive its monthly mean amplitude and phase. To facilitate the comparison between eCMAM and SABER, the results are interpolated with a 5-km vertical interval from 20 to 110 km for both datasets. The latitude range is from −87.5° N to 87.5° S for eCMAM30 and from 83° N (50° N) to 83° S (50° S) for SABER for the background mean (diurnal tidal amplitudes and phases) temperature comparisons. Monthly climatological background mean temperature and the amplitude and phase of the diurnal tides are calculated by vector averaging between January 1979 and June 2010 for eCMAM30 and between January 2002 and December 2013 for SABER. The above calculations are repeated for the overlapped period (January 2002 to June 2010) between eCMAM30 and SABER, and the difference is minor from the climatology calculated from each available period (not shown). The first step in the model validation is a comparison of the simulated zonal mean background temperature with the observations. Figure 1 shows the seasonally averaged zonal mean temperature in Northern Hemisphere (NH) spring (March, April, and May), summer (June, July, and August), autumn (September, October, and November), and winter (December, January, and February) obtained from eCMAM30 (left panel) and SABER (right panel). As can be seen from the comparisons for different seasons, there is very good agreement between the two datasets throughout the whole vertical domain of 20 to 110 km. The model reproduces the latitudinal temperature gradients quite well: a cold winter lower stratosphere, an elevated winter stratopause, a warm summer stratopause, and a cold summer mesopause. Temperature increases rapidly in the thermosphere. The main differences between the model and the observations are that the cold mesopause in the model is about 10 to 20 K colder and the elevated stratopause is at a slightly higher altitude than the observations. The mesopause low temperature is a result of the balance between the weak absorption of solar energy by O2 and the efficient radiation to space by CO2. Another source of global heating and cooling in the mesopause region is due to dissipating gravity waves and their interaction with the background atmosphere (Smith 2012). Middle atmosphere GCMs have been notorious for their inability to simulate the cold summer mesopause - the so-called ‘cold pole problem’. A cold pole implies too little dynamical heating induced by angular momentum deposition from small-scale internal gravity waves (Shepherd 2000). Correct representation of gravity waves in GCMs still remains as a challenge issue. Climatology of background temperature (in Kelvin). Another discrepancy between the model and SABER is that the increasing rate of temperature in the thermosphere (close to the upper limit of SABER's capability) is greater in the model than that in the SABER observations. However, both the model and SABER show a stronger vertical gradient in the summer hemisphere, which is again related to the dynamical summer (pole) to winter (pole) circulation and the resulting adiabatic heating/cooling effect (Smith et al. 2011). The SABER background temperatures shown here are consistent with previous SABER analyses such as Smith (2012). Overall, the zonal mean background temperature climatology is in very good agreement between eCMAM30 and SABER. In this section, we provide the climatology of the diurnal tides (Dw1, De3, Dw2, and Ds0) for temperature from eCMAM30 (including their latitudinal-altitudinal structures and seasonal variations) and its comparison with SABER tidal observations. At the end of the section, a brief description of the interannual variability of the diurnal tides (Dw1 and De3) from eCMAM30 is presented and compared to SABER. The detailed discussion of the interannual variability is out of the scope of this paper and will be pursued in the future. For this paper, 11 components of the diurnal tide were analyzed (from wave number s = −5 to +5). Figure 2 depicts the normalized amplitude of the 11 diurnal tidal components at four altitudes as a function of latitude for NH spring (a) and summer (b). The tidal amplitude is normalized to the maximum tidal amplitude to establish the relative significance of these oscillations at a particular altitude. And negative (positive) wavenumber denotes eastward (westward) propagation tidal component. The four altitudes (45, 60, 95, and 105 km) are chosen to represent the stratopause, lower mesosphere, mesopause, and lower thermosphere regions, respectively. The features at NH autumn (winter) are very similar to those at NH spring (summer); therefore, the figures are not shown. As illustrated in Figure 2, 11 diurnal tidal components are included in the spectrum, but in practice, relatively few tidal components (such as Dw1, De3, Dw2, and Ds0) are found to dominate. These diurnal tidal components have also been identified in previous analyses of satellite and model data (Talaat and Lieberman 1999; Forbes et al. 2003a, [b]; Forbes and Wu 2006; Forbes et al. 2006; Zhang et al. 2006; Huang and Reber 2004; Manson et al. 2004; Du 2008; Du et al. 2014) and are now well-accepted diurnal tides of importance in the MLT region.For the NH spring (March-May) at 45 km (Figure 2A), Dw1 is the dominant diurnal tidal component with a maximum located symmetrically at 15° to 85° and centered at 40° to 50° of each hemisphere in the eCMAM30. There is a secondary maximum (20% to 30% of the primary maximum amplitude) located between 0° and 10° S. SABER also shows that Dw1 is the dominant component at this altitude, and its latitudinal structure compares very well with eCMAM30. The spectrum composition is richer in eCMAM30 than SABER at this latitude. Besides Dw1, De3 is present in the range of 30° S to 30° N with 20% of the maximum amplitude of Dw1 in eCMAM30. Other nonmigrating diurnal tidal components such as Ds0, De1, and De4 are also present with 10% of the maximum amplitude of Dw1. In SABER, the amplitude of De3 is smaller than 10% of that of Dw1 and therefore not shown in the figure. Ds0 and Dw2 are also present at a limited latitudinal range with amplitude of 10% of the maximum amplitude of Dw1. Normalized wavenumber spectra of the diurnal tides (from De5 to Dw5) at 45, 65, 95 and 105 km during NH spring (A) and summer (B) from eCMAM30 (upper panel) and SABER observation (lower panel). Positive (negative) wavenumber denotes westward (eastward) propagating tidal component. The latitude range for SABER is 50°N-50°S. White dashed lines denote 50°N/S. The contour scale is from zero to unity with the interval of 0.1. At 65 km in the spring, the dominant component is still Dw1 in both eCMAM30 and SABER. However, its primary and secondary maxima are reversed from their counterparts at 45 km. The primary maximum of Dw1 is now located at the equatorial region in both eCMAM30 and SABER. Its secondary maximum is located symmetrically at 20° to 50° and centered at approximately 30° of each hemisphere in eCMAM30. The position of this secondary maximum in SABER is more pole-ward than eCMAM30 but is difficult to locate due to the cutoff latitude at 50° in SABER. De3 is present with 20% of the maximum amplitude of Dw1 in eCMAM30, but is still absent in SABER at this altitude. eCMAM30 still presents a richer spectrum than SABER. Besides Dw1 and De3, the nonmigrating tides Dw2, Ds0, De1, De2, De4, and De5 are also present with 10% of the maximum amplitude of Dw1 in eCMAM30. SABER only shows Ds0 and Dw2 in the spectrum at this altitude with relative amplitude of 10%. At mesopause region (95 km) in the spring, the dominant diurnal tidal components are Dw1 and De3 for both eCMAM30 and SABER. The latitudinal structure of Dw1 is very similar to that at 65 km in both eCMAM30 and SABER and compares well between the two datasets. The latitudinal structures of De3 are consistent between eCMAM30 and SABER as well. However, the relative amplitude of De3 is different: it increases to 40% comparing to the maximum amplitude of Dw1 in eCMAM30 and only 20% in SABER. Besides Dw1 and De3, both eCMAM30 and SABER show the presence of Ds0, De1, and De2 at this altitude with 10% relative amplitude. eCMAM30 also shows the presence of Dw2, De4, and De5 with 10% relative amplitude. At 105 km in the spring, the dominant components are still Dw1 and De3 for both eCMAM30 and SABER. As the overall latitudinal structures of Dw1 and De3 are similar, there are a few differences between the model and observations. The relative amplitude of the secondary maximum for Dw1 decreases from 40% at 95 km to 20% at 105 km in eCMAM30, while it increases from 40% to 60% in SABER. The relative amplitude of De3 stays similar (40%) from 95 to 105 km with maximum location shifting from 10° N to 30° S. On the other hand, SABER observation shows that the relative amplitude of De3 increases from 20% at 95 km to 60% at 105 km and maximizes at the equatorial region (5° N to 20° S) at both 95 and 105 km. This hemispheric asymmetry associated with De3 has been reported by previous SABER analyses (Forbes et al. 2006; Zhang et al. 2006). Besides Dw1 and De3, both eCMAM30 and SABER show the presence of Dw2, Ds0, De2, De4, and De5 with relative amplitude of 10% to 20%. SABER also shows the presence of Dw3 and De1 at this altitude with relative amplitude of 10%.During the NH summer (June-August) (Figure 2B), Dw1 and De3 are still the dominant diurnal tidal components for both eCMAM30 and SABER at all selected altitudes. However, their latitudinal structures and relative amplitudes are quite different from those of NH spring (Figure 2A). At 45 km, Dw1 is still characterized by broad mid- and high-latitude maxima in each hemisphere and a secondary maximum at the equator. However, the mid- and high-latitude maxima in the NH are much stronger than their counterparts in the Southern Hemisphere (SH), which results in hemispheric asymmetry. The above features for Dw1 are evident in both eCMAM30 and SABER. Similar to the NH spring, De3 is present at 45 km as 20% of the maximum Dw1 amplitude in eCMAM30 but is relatively absent in SABER. Both eCMAM30 and SABER show the presence of Ds0, Dw2, Dw3, and De1 with relative amplitude of 10% of the Dw1 maximum amplitude. At 65 km in the summer, both eCMAM30 and SABER show the magnifying of the equatorial maximum and decreasing of the mid- and high-latitude maxima. The mid- and high-latitude maxima are 30% to 40% of the equatorial maximum in both eCMAM30 and SABER. SABER shows more hemispheric asymmetry between the two mid- and high-latitude maxima than eCMAM30. The relative amplitude of De3 reaches 50% of the maximum amplitude of Dw1 at this altitude in eCMAM30 although it is much smaller (10%) in SABER. Other nonmigrating tides such as Dw2, Dw3, Ds0, and De1 are also present in the spectrum for both eCMAM30 and SABER with relative amplitude of 10%. The most dominant diurnal tidal component is De3 in eCMAM30 at 95 km during the NH summer. The relative amplitude of Dw1 is only 50% of the maximum amplitude of De3. SABER still shows Dw1 as the most dominant component with De3 being half of the maximum amplitude of Dw1 at this altitude. The overall spectrum agrees very well between eCMAM30 and SABER: the dominated diurnal components, the latitudinal structures of Dw1 and De3, and the slightly hemispheric asymmetry of the secondary maximum associated with Dw1. Besides Dw1 and De3, De2 is also present in both eCMAM30 and SABER with relative amplitude of 30% to 40% of the maximum tidal amplitude. Other nonmigrating tides such as Dw2, Dw3, Ds0, and De1 are also present in the spectrum for both eCMAM30 and SABER with relative amplitude of 10%. At 105 km in the summer, both eCMAM30 and SABER agree that De3 is the most dominant diurnal component. The latitudinal structure of De3 in eCMAM30 is slightly different from that in SABER: eCMAM30 shows one maximum located at 0° to 50° S and centered on 20° S and a secondary maximum (half of the primary maximum) located at 10° to 60° N and centered on 25° N, while SABER shows one broad maximum between 50° N and 50° S and centered on the equator. The maximum relative amplitude of Dw1 is 50% to 60% of that of De3 in eCMAM30 and located in the equatorial region. The secondary maxima at the mid- and high latitudes seen at 95 km are absent at this altitude in eCMAM30. In SABER, the maximum amplitude of Dw1 is about half of that of De3. The maxima are located at the equator and 10° to 30° N, respectively. This strong hemispheric asymmetry is not present in eCMAM30. Besides Dw1 and De3, there are other nonmigrating diurnal tidal components present in the spectrum such as Dw2, Ds0, De1, and De2 with 10% relative amplitudes in both eCMAM30 and SABER. Overall, the tidal component composition and their relative strength at various altitudes compare very well between eCMAM30 and SABER. During the NH spring, the migrating Dw1 component has the largest monthly mean amplitude while the nonmigrating De3 component has the second largest monthly mean amplitude at all four altitudes. During the NH summer, the migrating Dw1 component has the largest monthly mean amplitude below 65 km while the nonmigrating De3 component becomes the strongest in the upper MLT region although the model and SABER disagree on the exact changeover altitude. The spectrum is richer in NH summer than NH spring due to the weaker amplitude of Dw1. The latitudinal structures of the diurnal tides between the model and SABER are also in very good agreement especially during NH spring. Besides Dw1 and De3, both the model and SABER show that Ds0 and Dw2 can be important at a certain season and altitude. In this section, we present the climatological altitude-latitude structures of the migrating component Dw1 and three nonmigrating components De3, Dw2, and Ds0 from both eCMAM30 and SABER. As shown in the previous section, Dw1 and De3 are the two most dominant diurnal tidal components from the troposphere to the MLT region. Dw2 and Ds0 are also persistently present in the spectrum at various altitudes and seasons and believed to be generated by the nonlinear interaction between the migrating diurnal tide Dw1 and the stationary planetary wave with wave number 1 - SPW1 (Hagan and Roble 2001; Lieberman et al. 2004; Grieger et al. 2004). The altitude range presented in this section is from 40 to 110 km because the tidal perturbations below 40 km are small. Figure 3 shows the cross section of the temperature amplitude (in Kelvin) and phase (in hour) of Dw1 as a function of latitude and altitude for March (a) and July (b) derived from eCMAM30 (left) and SABER (right). The months of March and July are chosen since Dw1 tends to maximize during equinox and minimize during solstice (more on seasonal variation in ‘Seasonal variations of the diurnal tides’). For March (Figure 3A), both eCMAM30 and SABER show that the structure of Dw1 above 60 km is characterized with an equatorial maximum and two secondary maxima located symmetrically in the mid-latitudes (near ±35°) of each hemisphere. Dw1 in this region is mainly excited by H2O solar radiation absorption in the troposphere, but tropospheric latent heating (Forbes et al. 1997) and ozone absorption (Hagan 1996) can also make nonnegligible contributions. The equatorial maximum is located between 100 and 110 km in eCMAM30 with maximum amplitude of 28 to 30 K. The same maximum in SABER is located lower than that in eCMAM30 at 95 to 100 km with lesser maximum amplitude of 20 K. Wave growth with height over the equator is more rapid for eCMAM30 than SABER above 60 km, which suggests that the eCMAM may be under-damping the wave (i.e., not enough eddy diffusivity). The secondary maxima in the mid-latitudes have similar maximum amplitude of 8 to 9 K in both eCMAM30 and SABER. Climatological latitude-altitude cross-sections of temperature amplitude (in Kelvin) and phase (in hour) of Dw1 for March (A) and July (B) from eCMAM30 (left panel) and SABER observation (right panel). White dashed lines denote the latitude 50°N/S. The contour interval is 2 K for March and 1 K for July. The phase structure is symmetric over the equator and in very good agreement between the model and SABER. Both SABER and eCMAM30 show the 180° phase shift between the equatorial and mid-latitude maxima. The phase decreases with height, which indicates the upward propagation of the tide Dw1 in this region. The vertical wavelength of the propagating tide is about 20 to 25 km in both eCMAM30 and SABER, which is also in agreement with previous SABER (Zhang et al. 2006; Forbes et al. 2006; Smith 2012) and MLS analyses (Forbes and Wu 2006). Significant amplitudes (2 to 4 K) also exist at high latitudes (60° to 70°) in eCMAM30, indicating the presence of trapped modes, possibly indicative of an in situ source of excitation (i.e., chemical heating). Between 40 and 60 km in March (Figure 3A), the latitudinal structure of Dw1 is different from above and is characterized by two maxima located in the mid- and high latitude of each hemisphere. These features are in good agreement between the model and SABER observations with monthly mean amplitude of 2 to 4 K. The SH maxima are slightly stronger and broader than their NH counterparts in both datasets. Both maxima correspond to constant phase in eCMAM30 and SABER, which indicates that Dw1 is trapped in situ and cannot propagate upward. This is most likely due to the effects of absorption by solar radiation by ozone, giving rise to an in situ diurnal temperature response that is strongly influenced by the latitudinally broad trapped (nonpropagating or evanescent) diurnal tidal modes (Forbes and Garrett 1979). This local maximum of Dw1 between 40 and 60 km has also been reported by previous satellite data analyses such as those by Forbes and Wu (2006), Forbes et al. (2006), and Zhang et al. (2006).In July (Figure 3B), the latitudinal structure of Dw1 is more complicated than that in March (Figure 3A). The overall structure is in good agreement between eCMAM30 and SABER. The structure above 60 km is still characterized with an equatorial maximum and two secondary mid-latitude maxima, but some features are different from those in March. The equatorial maximum below 90 km is tilted toward the SH in both eCMAM30 and SABER, and the mid-latitude maximum in each hemisphere contains multiple peaks at different altitudes. Both eCMAM30 and SABER show a three-peak feature in the NH, whereas SABER shows a four-peak feature in the SH and eCMAM30 shows a single peak. The equatorial maximum amplitude is 11 to 12 K for both eCMAM30 and SABER and much weaker than that in March. The secondary maximum amplitude is mainly 3 to 5 K for both eCMAM30 and SABER. The phase decreases with height and compares very good between the model and SABER with less hemispheric symmetry than that in March. The above features indicate combined contributions of both symmetric and asymmetric Hough modes associated with Dw1 in July. Below 60 km, the structure is still characterized by the mid- and high-latitude maxima in each hemisphere, but hemispheric asymmetry is obvious in both eCMAM30 and SABER. The maximum in NH is much broader than that in the SH. The maximum amplitude in eCMAM30 is about 1 to 2 K, while SABER has a maximum amplitude of 2 to 4 K in this region. The phase stays constant with height and implies that Dw1 is locally trapped. The nonmigrating tide De3 is primarily excited by latent heating due to deep tropical convection in the troposphere (Forbes et al. 2001). It is shown by Forbes et al. (2006) that the existence of De3 is intimately connected with the predominant wave-4 longitude distribution of topography and land-sea difference at low latitudes. Figure 4 shows the altitude-latitude cross section of temperature amplitude (in Kelvin) and phase (in hour) of De3 for April (a) and August (b). April is the month that De3 reaches moderate amplitude, and August is the month that De3 reaches maximum amplitude in SABER (more on its seasonal variation in ‘Seasonal variations of the diurnal tides’). In April (Figure 4A), both eCMAM30 and SABER show broad maximum feature with strong hemispheric asymmetry in the MLT region. The broad feature extends from 70° S to 60° N and maximizes at 40° to 50° S and 110 km in eCMAM30. There is a secondary maximum located at 10° to 20° S and 100 km. The maximum amplitude of De3 in SABER is located at 10° S and 110 km. Both eCMAM30 and SABER show the broad feature extending to a lower altitude of 75 to 85 km at 0° to 30° N. The maximum amplitude of De3 is stronger in eCMAM30 (17 K) than that in SABER (10 K). The phase structure between eCMAM30 and SABER for April compares very well with decreasing phase with height in the MLT region. The phase in eCMAM30 is more variable than that in SABER due to the more complex amplitude structure. Climatological latitude-altitude cross-sections of temperature amplitude (in Kelvin) and phase (in hour) of De3 for April (A) and August (B) from eCMAM30 (left panel) and SABER observation (right panel). White dashed lines denote the latitude 50°N/S. For De3 in August (Figure 4B), both the latitude-height distribution and the maximum amplitude of the De3 compare very well between eCMAM30 and SABER. The maximum is located between 0° and 30° S in both data and at 105 km in eCMAM30 and 105 to 110 km in SABER. A secondary maximum is present between 30° N and 60° N at 110 km for eCMAM30, while SABER shows a broad feature from 50° S to 50° N. The maximum amplitude of De3 is 18 K for both eCMAM30 and SABER. Another interesting feature is that the maximum feature at 105 km extends to 0° to 30° N at 70 to 80 km and to 0° to 30° S at 40 to 70 km in both eCMAM30 and SABER. The phase is decreasing with height above 75 km and stays constant below 75 km in both data, indicating upward propagating and locally trapped modes, respectively. Similar vertical wavelengths for the observed and modeled De3 are seen in the 80- to 110-km-height region where the amplitudes are largest. Forbes et al. 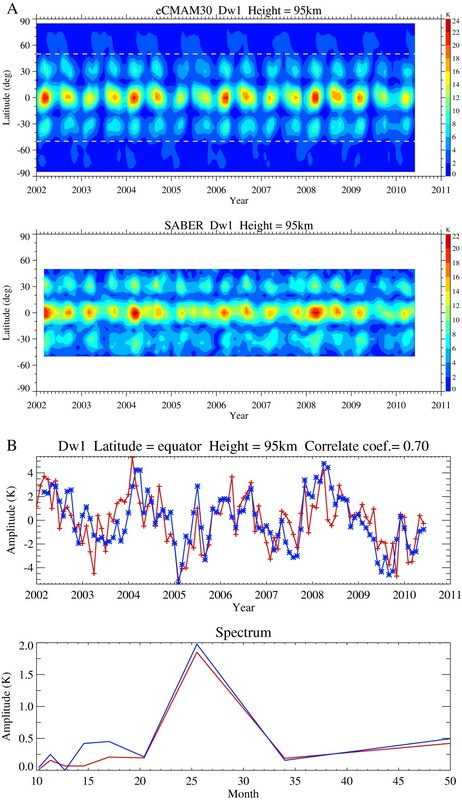 (2006) compared the height versus latitude amplitude distribution of De3 derived from SABER during July and September 2002 with three model results. The three models are the climatological global-scale wave model (GSWM), the GSWM/NCEP (the GSWM utilizes heating rates from the NCAR/NCEP Reanalysis Project), and the Kyushu GCM with full tropospheric physics with heating rates from the NCAR/NCEP reanalysis. All three models predict very similar latitude-height distribution as SABER, but the amplitude is either a factor of 2 too low (GSWM and Kyushu GCM) or 2 too large (GSWM/NCEP). The amplitude peaks at different altitudes for the models and SABER as well. The differences were contributed to possible differences between the De3 vertical wavelengths and molecular viscosity profiles in the models and in the atmosphere. Figure 5 shows the altitude-latitude cross sections of climatological amplitude and phase of Dw2 in November (a) and of Ds0 in December (b), at which they reach their maximum amplitude in both datasets. For Dw2 in November (Figure 5A), both eCMAM30 and SABER present an equatorial maximum which tilts toward the NH between 70 and 90 km and toward the SH below 70 km. The maximum amplitude is located slightly south of the equator in both datasets at 105 km with magnitude of 7 to 8 K. The amplitude between 70 and 90 km is larger in SABER (4 to 5 K) than eCMAM30 (2 to 3 K). The equatorial feature is indicative of propagating modes (Forbes and Wu 2006). There are two secondary mid-latitude maxima in SABER with amplitude approximately 5 K in the SH and 2 to 3 K in the NH, which are not obviously present in eCMAM30. The mid-latitude maxima have also been observed by MLS/UARS at 86 km, which is associated with trapped modes (Forbes and Wu 2006). The phase between the two datasets compares very well: the phase is symmetric about the equator and decreases with height with a vertical wavelength of 25 to 30 km. Climatological latitude-altitude cross-sections of temperature amplitude (in Kelvin) and phase (in hour) of Dw2 in November (A) and of Ds0 in December (B) from eCMAM30 (left panel) and SABER observation (right panel). White dashed lines denote the latitude 50°N/S. The contour interval for amplitude is 0.5 K for Dw2 in November, and 1 K for Ds0 in December. 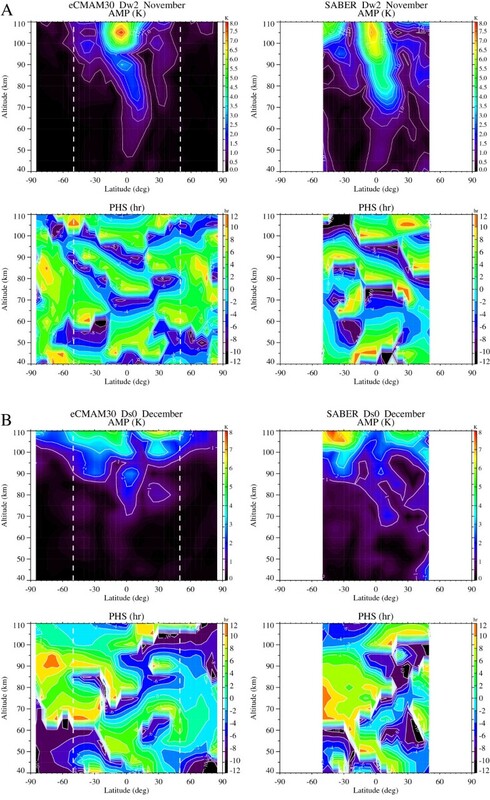 The contour interval for phase is 2 h.
For Ds0 in December (Figure 5B), there are two broad maxima located at 0° to 60° of each hemisphere above 100 km for both eCMAM30 and SABER with similar amplitude magnitude of 7 to 8 K. Both eCMAM30 and SABER show hemispheric asymmetry of the amplitude magnitude between the two maxima. The maximum in the SH is slightly stronger than its NH counterpart in SABER, while it is the opposite in eCMAM30. The latitudinal asymmetry was also found in UARS temperature measurements at 86 km (Forbes and Wu 2006) and wind measurements at 95 km (Forbes et al. 2003b). Below 100 km, both datasets show more complex structure: a locally trapped equatorial maximum and two maxima in the mid-latitudes of each hemisphere, which propagate upward. SABER also shows a local maximum at 40 km and 50° N, which has been reported by Xu et al. (2014) as nonlinear interaction effect between the SPW1 and the migrating diurnal tide Dw1. On the other hand, this local maximum is possibly induced by aliasing effect from the nonstationarity of the SPW1 during the fitting interval (Forbes and Wu 2006; Sakazaki et al. 2012), and it is obviously not present in eCMAM30. The phase structures are in good agreement between the two datasets. For the maxima above 100 km, the phase is anti-symmetric about the equator and the phase structure is more variable below 100 km. In this section, we present the seasonal variations of the migrating diurnal tide (Dw1) and three nonmigrating diurnal tidal components (De3, Dw2, and Ds0) from eCMAM30 at several representative altitudes and their comparisons with SABER observations. 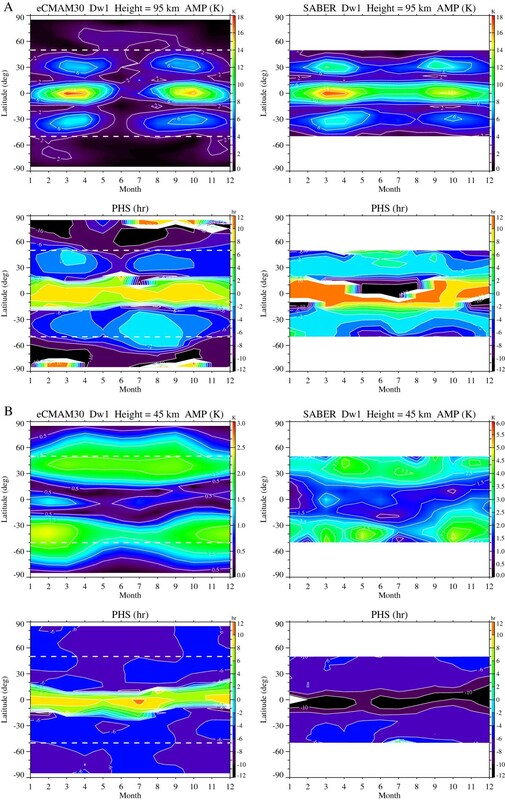 Figure 6 illustrates the seasonal variations of Dw1 temperature amplitude and phase at 95 km (a) and 45 km (b) from both eCMAM30 and SABER. At 95 km (Figure 6A), both eCMAM30 and SABER show that the amplitude of the Dw1 in the MLT region exhibits a strong semiannual variation, which is characterized by equinoctial maxima and solsticial minima. This semiannual variation is well documented in both ground-based and previous satellite observations (Vincent et al. 1998; Fritts and Isler 1994; Hays and Wu 1994; Burrage et al. 1995; McLandress et al. 1996; Zhang et al. 2006). Three explanations have been proposed for the semiannual variation of Dw1: semiannual variation in the heating that forces the tide (Lieberman et al. 2003; Hagan and Forbes 2002; Xu et al. 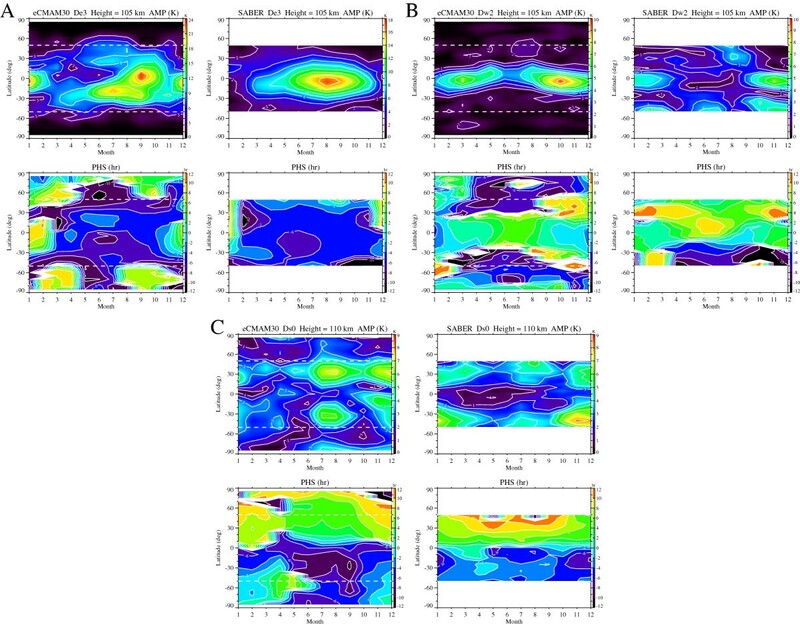 2010), variation of the background winds in the tropical stratosphere and mesosphere (McLandress 2002a, [b]), and variations due to damping within the MLT region (Xu et al. 2009a; Lieberman et al. 2010). 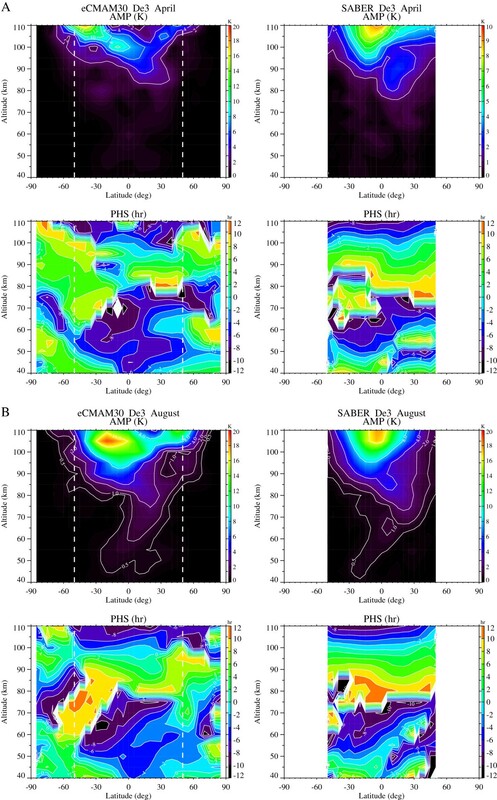 Seasonal variations of climatological temperature amplitude (in Kelvin) and phase (in hours) of Dw1 at 95 km (A) and 45 km (B) from eCMAM30 (left panel) and SABER observations (right panel). White dashed lines denote the latitudes of 50°S and 50°N. Both eCMAM30 and SABER show that the spring maximum (16 to 18 K) is slightly stronger than the autumn maximum (12 to 16 K). The magnitude of the equinox maxima is in agreement with previous SABER analysis (Zhang et al. 2006). SABER has much stronger amplitude (10 K for the equatorial maximum and 4 K for the mid-latitude maxima) during solsticial minima than eCMAM30 (2 K for both equatorial and mid-latitude maxima) at 95 km. The magnitude of the two mid-latitude maxima is similar in eCMAM30, while the NH mid-latitude maximum tends to be stronger than the SH counterpart in SABER. Moreover, Dw1 exhibits an annual variation in the Polar Regions in eCMAM30, which has also been reported in Du et al. (2014) from the free-running eCMAM. The phase of Dw1 is symmetric about the equator and less variable than its amplitude at 95 km in both datasets. In the equatorial region, the phase is approximately 8 to 10 LT all year round in eCMAM30, while it is 2 h ahead (10 to 12 LT) in SABER. Both eCMAM30 and SABER show that the phase difference between the equatorial region and the mid-latitudes is approximately 12 h. At mid-latitudes, the phase from eCMAM30 exhibits an annual variation with phase varying from approximately 0 LT during January and December (May and June) to 10 to 12 LT during June to September (February to April) in the SH (NH). SABER shows similar annual variation but the phase is 2 to 4 h ahead.Figure 6B shows the seasonal variation of Dw1 at 45 km from both eCMAM30 and SABER. There is a clear annual variation in the amplitude of Dw1 at 45 km. It is a broad feature from 15° to 20° N (S) to 80° N (S) during nonwinter months with amplitude of 2 to 3 K. During winter months (November, December, and January in NH and May to August in SH), this feature shrieks in latitudinal coverage to 30° to 60° N (S) with amplitude of 2 K. The latitudinal structure of Dw1 at 45 km within 50° N/S from SABER compares well with eCMAM30 but with multiple peaks (April in NH and March, May, and October in SH). The maximum amplitude in SABER can reach 5 to 6 K, which is larger than that in eCMAM30 at this altitude. Both eCMAM30 and SABER show an equatorial maximum during March although it starts earlier in eCMAM30 (February) than in SABER. The phase compares well between the two datasets at 45 km. Phase structure shows little variation (less than 2 h difference) over the year at all latitudes from both eCMAM30 and SABER. The magnitude is approximately 6 LT in both eCMAM30 and SABER in the mid-latitudes of each hemisphere. The phase at the equatorial region is about 4 h difference from the mid-latitude phase in SABER and 6 h difference in eCMAM30. The seasonal variations of three nonmigrating diurnal tides De3 (a), Dw2 (b), and Ds0 (c) at the altitude where their maximum is located are presented in Figure 7. For De3 at 105 km (Figure 7A), the seasonal variation is dominated by an annual variation in SABER with amplitude reaching maximum (12 K) between June and October and minimum between December and March (<4 K). SABER De3 distribution is symmetric-like about 10° S latitude. These features are in agreement with previous SABER analysis (Zhang et al. 2006). There are some differences between eCMAM30 and SABER on seasonal variation of De3. The model shows a strong NH winter maximum between 5° N and 10° S, which is not present in SABER, which might imply that eCMAM overestimates the latent heat release during this season. Other maxima are located at 5° N to 5° S in September and 10° to 30° S in July in eCMAM30. The magnitude for the NH summer maximum is similar between eCMAM30 and SABER. For the broad maximum between March and November, the phase varies between 16 and 20 LT in both SABER and eCMAM30. The phase between December and February is different between the two datasets due to the amplitude difference during this period.For Dw2 at 105 km (Figure 7B), the seasonal variation in eCMAM30 is dominated as a semiannual variation with maximum in March and October and minimum in January, June, and July. The maximum in October (9 to 10 K) is slightly larger than that in March (7 to 8 K) in eCMAM30. There is an annual variation with the latitudinal structure of Dw2 in eCMAM30. The maximum is located at between 5° N and 20° S between September and March and at 5° S to 20° N between April and August. The seasonal variation in SABER is dominated by an annual variation with maximum amplitude in September-April and minimum amplitude in May-August. The maximum amplitude is similar between the two datasets with eCMAM30 maximum (9 to 10 K) slightly larger than SABER (7 to 8 K). The annual variation of the latitudinal structure of Dw2 as seen in eCMAM30 is not present in SABER. Besides the equatorial maximum, there are also multiple peaks in mid-latitudes (August in NH and February-March, June, and November in SH) from SABER, which are not present in eCMAM30. The phases associated with the equatorial maximum in eCMAM30 and SABER both present an annual variation. The phase is 22 to 24 LT during September and March, and 2 to 4 LT during April and August in eCMAM30 and SABER is about 6 h ahead of eCMAM30 all year round.For Ds0 at 110 km (Figure 7C), the seasonal variation of Ds0 agrees very well between eCMAM30 and SABER. Both datasets present multiple peaks that are centered on 30° N/S. The timing of the maxima is consistent between the two datasets. The maxima are symmetric about the equator and are present during October-March and June-September. The magnitude of the maxima (7 to 9 K) is very similar between eCMAM30 and SABER as well. The relative strength of the peaks is slightly different: eCMAM30 shows that the NH peaks are stronger than their southern counterparts while SABER shows the opposite during October-March. The phase between the two datasets also compares very well. The phase is anti-symmetric about the equator with little variation all year round. In the NH (SH), the phase is about 2 (14) to 8 (18) LT. 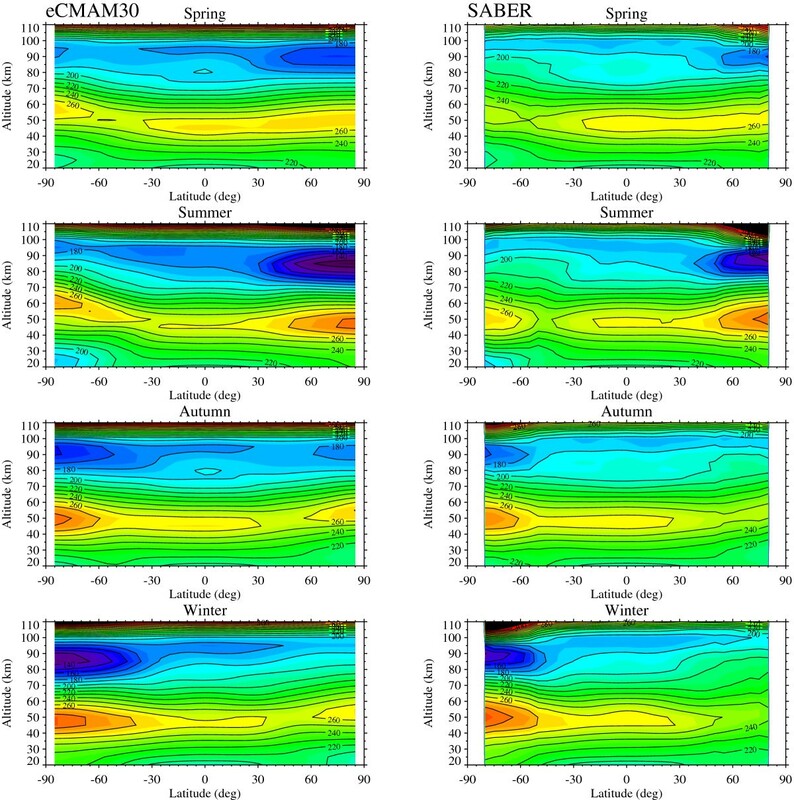 Seasonal variations of climatological temperature amplitude (in Kelvin) and phase (in hours) of the nonmigrating diurnal tides De3 at 105 km (A); Dw2 at 105 km (B); and Ds0 at 110 km (C) from eCMAM30 (left panel) and SABER observations (right panel). White dashed lines denote the latitudes of 50°S and 50°N. Long-term tidal variability did not receive much attention up to now. Indeed, to study it, long time series of observations or model runs are needed. This practically excluded its study in the middle and upper atmosphere until recently. There are two potentially important natural internal sources of long-term tidal variability in our atmosphere: the El Niño-Southern Oscillation (ENSO) and the stratospheric quasi-biennial oscillation (QBO). With the large variations in the rainfall and latent heat patterns caused by ENSO, it is to be expected that it will have a noticeable effect on the tides. A few studies have investigated the role of the ENSO (Vial et al. 1994; Gurubaran et al. 2005; Lieberman et al. 2007; Pedatella and Liu 2012, 2013; Warner and Oberheide 2014) and QBO (Vincent et al. 1998; Hagan et al. 1999; Mayr and Mengel 2005; Wu et al. 2008a, [b]; Xu et al. 2009b; Oberheide et al. 2009; Gurubaran et al. 2009; Wu et al. 2011) on driving interannual tidal variability. However, a comprehensive view of the tidal change that occurs in response to the ENSO and QBO is still lacking. A common deficiency suffered by many free-running GCMs is the absence of a QBO. By nudging wind and temperature to the reanalysis data in the troposphere and stratosphere, the eCMAM is able to produce the stratospheric QBO (not shown), thus allowing a more realistic interaction between the atmospheric tides and background atmosphere. The sea surface temperature (SST) in the model is subscribed to monthly global complete fields of SST and sea ice concentration at each latitude-longitude grid from the Met Office Hadley Center's see ice and sea surface temperature dataset (HadISST) during the same time period of 1979 to 2010. Therefore, ENSO is also included in the model in a realistic way. A major advantage of using data-assimilated middle atmosphere models such as eCMAM30 to study interannual variation of the atmospheric tides is to have many available variables (296 in the case of eCMAM30) that are self-consistently generated and regularly saved at even spatial and temporal grids. This complete dataset enables a comprehensive evaluation on the momentum and energy budget of the atmospheric tides and its relationship with natural variability in the atmosphere such as ENSO and QBO. Here, we present a simple validation of the interannual time series of two dominant diurnal tides (Dw1 and De3) from eCMAM30 against SABER at the overlapped data period (January 2002 to June 2010).The monthly mean temperature amplitude of Dw1 at 95 km from both eCMAM30 and SABER is illustrated in Figure 8 for the period of January 2002 to June 2010. As seen in previous sections, the climatological latitudinal-altitudinal structure and seasonal variation of Dw1 from eCMAM30 are in excellent agreement with SABER. From Figure 8A, the amplitude of Dw1 clearly presents a strong interannual variation. The March and September equinox maxima are stronger in the years of 2002, 2004, 2006, and 2008 in both eCMAM30 and SABER than other years. Figure 8B presents the interannual anomaly time series and its Fourier spectrum at the equator and 95 km from eCMAM30 (red) and SABER (blue). The interannual anomaly is calculated by subtracting the annual mean and seasonal variation from the original time series. The interannual anomaly can reach −10 K to +10 K for eCMAM30 and is slightly weaker in SABER (from −5 K to +9 K). The Dw1 in years of 2003, 2005, 2007, and 2009 has weaker amplitude than the climatology. The anomaly between eCMAM30 and SABER follows closely and the correlation between the two datasets is 0.7. The Fourier spectrum of the interannual anomaly has a peak at 25 to 26 months from both eCMAM30 and SABER with amplitude greater than 1.5 K, which is likely associated with equatorial QBO of background zonal wind in the stratosphere.Figure 9 is similar to Figure 8, but for the interannual variation of De3 at 105 km. The discrepancies associated with seasonal variation of De3 are obvious between the model and SABER. As mentioned in ‘Seasonal variations of the diurnal tides,’ the January maximum presented in the model is not seen in SABER. 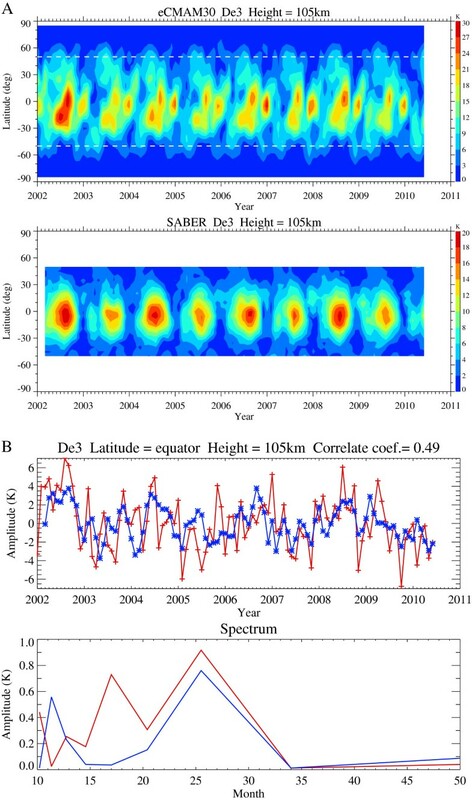 At 105 km (Figure 9A), SABER shows stronger De3 amplitude in 2002, 2004, 2006, and 2008 than in other years. On the other hand, eCMAM30 presents strongest De3 amplitude in 2002 and stronger amplitude in 2004 and 2006. The 2-year cycle is interrupted in eCMAM30 for 2008 and its amplitude is not as strong as those for 2004 and 2006. The correlation of the interannual anomaly time series from eCMAM30 and SABER is 0.49 for De3 at the equator and 105 km. The Fourier spectrum of the time series from SABER (blue line in Figure 9B) shows a peak at 11 to 12 months and another peak at 25 to 26 months, while the spectrum from eCMAM30 (red line) shows a peak at 16 to 17 months and another one at 25 to 26 months. The amplitude spectrum peak at 25 to 26 months presented in both SABER and eCMAM30 is likely associated with QBO in the stratosphere. The cause of the interannual variation and its relationship to QBO and ENSO will be investigated in more detail in a separate paper. (A) Inter-annual variation of Dw1 amplitude at 95 km as a function of latitude from eCMAM30 (top) and SABER (bottom) for the period of January 2002 to June 2010. White dashed lines denote 50°S and 50°N. (B) Interannual amplitude anomaly of Dw1 above equator at 95 km (top) and its amplitude spectrum (bottom) from eCMAM30 (red) and SABER (blue). Same as Figure 8 , but for De3 at 105 km. The newly nudged eCMAM30 temperature data (from January 1979 to June 2010) is used to study the climatology of background mean temperature and diurnal tides in the stratosphere and MLT region. The modeled background mean temperature and diurnal tides are validated against the diurnal tidal climatology observed from SABER for the last decade (from January 2002 to December 2013). For the background mean temperature, the model reproduces the latitudinal temperature gradients quite well. The main difference is that the cold mesopause in the model is about 10 to 20 K colder than that in SABER, which is a common problem associated with GCMs with insufficient gravity wave forcing. For the diurnal tidal spectrum, the tidal composition and their relative strength agree very well between the two datasets in both the stratosphere and MLT regions. During the NH spring, the migrating Dw1 component has the largest amplitude while the nonmigrating De3 component is the second largest. During the NH summer, Dw1 has the largest amplitude below 65 km while De3 becomes the strongest in the upper MLT region although the model and SABER disagree on the exact altitude for this changeover. The spectrum is richer in NH summer than NH spring due to the weaker amplitude of Dw1. The climatological altitude-latitude structures of the migrating diurnal tide Dw1 and three nonmigrating diurnal tides De3, Dw2, and Ds0 from the eCMAM30 and SABER are generally in very good agreement. Besides the better-known feature associated with Dw1 in the MLT region, the model reproduces the observed trapped local maximum between 40 and 60 km very well. In addition to the good agreement above 90 km, the altitude-latitude structure of De3 in August between 40 and 90 km (with amplitude <4 K) also compares well between the model and SABER. Similar characteristics are also found for the altitude-latitude structure of Dw2 and Ds0. The phase and vertical wavelength of the tidal components presented are also in very good agreement between the model and SABER. The seasonal variations of the diurnal tidal components compare well between the model and SABER. The semiannual variation at 95 km and the annual variation at 45 km associated with Dw1 observed in SABER are well represented in the model. For Ds0, both datasets present multiple peaks with consistent timing for these peaks. The largest discrepancy associated with the seasonal variation between the model and SABER occurs with De3. Besides the NH summer maximum presented in both eCMAM30 and SABER, the model also shows a maximum during NH winter (December-February), which is not present in SABER. This might imply that the model is overestimating the latent heat release during NH winter. The interannual time series of Dw1 and De3 are also shown from both datasets for the period of January 2002 and June 2010. Spectral analysis of the interannual variability reveals a strong peak at 25 to 26 months in both eCMAM30 and SABER, which indicates the modulation of diurnal tides by the stratospheric QBO. A detailed study of the interannual variability of the tides with this dataset will be pursued in more details in the future. Overall, we consider the climatology of the diurnal tides simulated by the eCMAM30 to agree very well with the observations, although there are some differences. The data-assimilated eCMAM does perform better than the free-running version of the model in terms of simulating more realistic tidal amplitude and phase. The form of the model parameterization schemes relevant to tidal forcing (such as latent heat release and/or the convective parameterizations) and dissipation (associated with parameterized gravity waves) play a major role in the form of the eCMAM results and are potential sources for these discrepancies. Another potential source is differences between the background fields of the model and the real atmosphere, which affect the filtering of and nonlinear interactions between components. The investigation of these dependencies requires more extensive observations and model analyses and is certain to be the subject of future investigations. More work is required to understand and refine tidal source mechanisms, in particular latent heat release and convective parameterizations, in order to improve model simulations. aThroughout paper, we utilize the notation Dws or Des to denote a westward or eastward propagating diurnal tide, respectively, with zonal wave number s. The standing oscillations are denoted as Ds0. Of these tidal components, Dw1 is the migrating tides and the rest are nonmigrating tides. The authors would like to thank Dr. Jia Yue from Hampton University and Dr. Anne Smith from NCAR for their helpful comments on the manuscript. Quan Gan was funded by the College of Arts and Science, University of Louisville, and by the National Natural Science Foundation of China (grant 41304120) and National Basic Research Program of China (grant 2012CB825605). Jian Du was funded by NSF CEDAR grant AGS-1243019. William E Ward was supported by the Natural Sciences and Engineering Council (NSERC) and the Canadian Foundation for Climate and Atmospheric Science (CFCAS). Stephen R Beagley and Victor I Fomichev were supported by the Canadian Space Agency. Shaodong Zhang was supported by the National Basic Research Program of China (grant 2012CB825605). JD, WEW, SRB, and VIF carried out the eCMAM30 study for diurnal tides. QG and SZ carried out the SABER observation study for diurnal tides. All authors read and approved the final manuscript.